According to an open records request, thieves stole more guns from cars last year than the year before. AUSTIN, Texas — Many people own guns for personal protection. But, some of those guns are ending up in the wrong hands. Blake Linkenhoger, who lives in East Austin, is on the growing list of Austinites who have had their guns stolen out of their cars. "I would usually just keep it in my center console here," Linkenhoger said. "And all they had to do was just open that up and grab it. Unfortunately, it doesn't lock." In February 2017, someone broke into his truck and stole his 9mm pistol. "I just kind-of felt sick. Your personal space had been gone through," he said. He typically brought his gun with him inside his home, but he left it in his truck that day -- a mistake Austin police want gun owners to avoid. "Keep that on your person, if at all possible. If you have to leave that in a vehicle, maybe use a lock box or something like that," Officer Destiny Silva said. "But, just be responsible and make good choices so that you don't leave yourself open to becoming a victim of an offense." 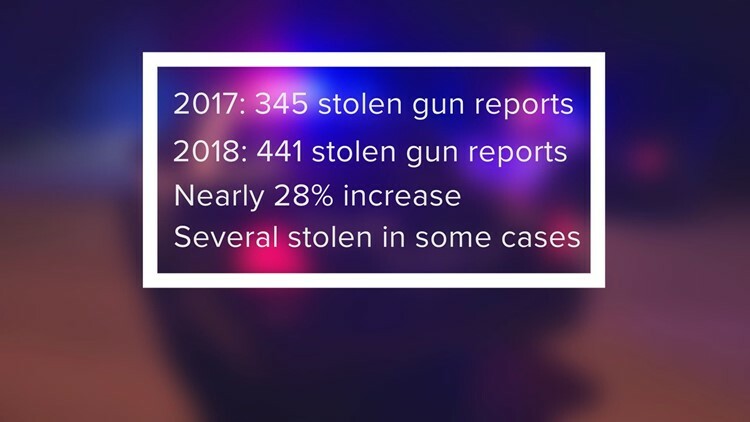 According to an open records request KVUE submitted to APD in February, thieves stole more guns out of cars in 2018 than the year before. According to the records, in 2017, Austin police received at least 345 reports of guns stolen from cars. The following year, that number rose to at least 441 reports -- a nearly 28 percent increase. And in some cases, thieves stole more than one gun. "We take these offenses very seriously, so we will investigate these. They will get assigned to a detective for follow-up, and we'll do our best to locate the weapon," Officer Silva said. She believes it's possible some of these stolen guns end up on the black market -- or worse. "They can be used in any type of violent offense where somebody could be hurt," she said. Linkenhoger said police never recovered his gun, and Austin police couldn't say how many guns its officers have recovered. But, Linkenhoger hopes his story serves as a warning to other gun owners. "Be responsible, and take it inside. Don't leave it in your truck 'cause that just leaves it open to the hands of criminals," he said. As soon as you realize someone has stolen your gun, Officer Silva said you should file a police report. Provide as much information about the gun as possible, including the serial number. That can help officers recover it.